October 28, 2015 — For those of you with a short memory, it was Wednesday and the Clippers won 111-104. 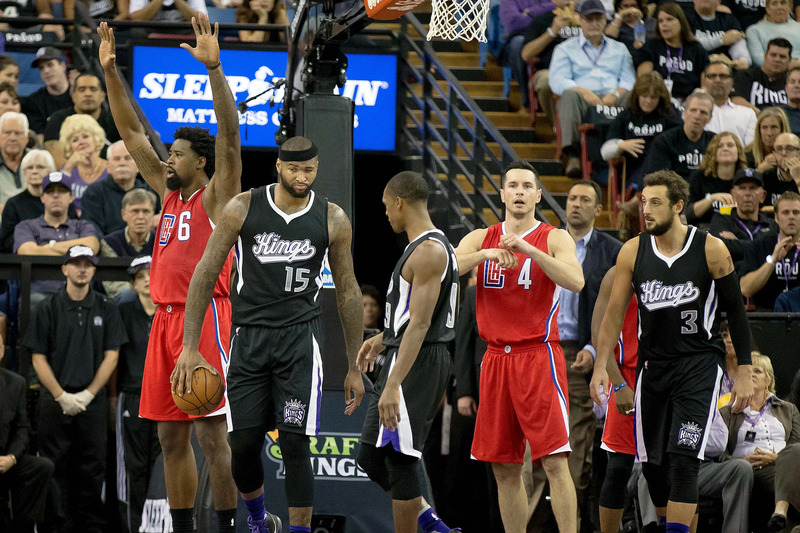 The Clippers led all game but left the door open just enough for the Kings to make a comeback on Opening Night. Fortunately, the newly acquired Paul Pierce helped slam it shut. Also, DeMarcus Cousins shoots threes now. Well, the Clippers downed the Mavericks at home to move to 2-0. Meanwhile, the Kings took out their intra-state animosity towards the Clippers out on L.A.’s other team, in a 132-114 drubbing of the Lakers (in regulation!). DeMarcus Cousins said he hates the Clippers on Wednesday and the following night Mark Cuban had some harsh words to say about the franchise. Are the Clippers the NBA’s most hated team? 1. You’re starting an NBA franchise tomorrow who do you take: DeMarcus Cousins or Blake Griffin? Leo Beas, Cowbell Kingdom, (@beasleo): If I would start an NBA franchise tomorrow, I would definitely choose DeMarcus Cousins over Blake Griffin. Cousins is such a powerful force down low and not many can compete with his smooth inside game and now his much-improved 3-point jump shot. Griffin is an amazing athlete with an improved jump shot but Cousins is on another level. But I’m sure many people have strong arguments to go with Griffin but I like Cousins’ toughness and we can note that he really has stayed healthy physically. That is very important because Griffin has had knee problems that may come up in the near future. I hope not because the NBA is better when Griffin is on the floor being a highlight machine. Brandon Tomyoy, (@dingyu): Blake Griffin. He’s one of the highest-percentage finishers at the basket in the league, his ability to make shots from beyond 18 feet is nearing Bosh-esque levels, and on top of that, he might just be the best passing big man in the entire league. It can even be argued that he has surpassed Chris Paul to become the best player on the Clippers roster. This is not to discount DeMarcus Cousins, who has become a top-five Center in his own right, but what Blake Griffin has done in taking his stellar playoff performance from last season into the fledgling stages of this season could help make a case that he’s a top-five player in this league. Sareen Tavidian, (@sarenetavidian): I would definitely choose Blake Griffin. His athleticism and skill set allow him to be a multifaceted player, whether he is running down the court on defense or hitting the mid-range jumper; something DeMarcus Cousins cannot achieve with such ease. Also, his demeanor on and off the court has put him alongside Chris Paul, as a leader in the locker room. Blake Griffin has shown a lot of promise as the Clippers move into game three and there’s no doubt that he will continue to surprise us with his undeniable talents. Beas: False. Lance Stephenson will not have a better season than Rajon Rondo because Rondo is the floor general of the Kings. Rondo will have way more opportunities to make plays and play consistent minutes on the floor. Stephenson is extremely inconsistent and the Clippers are deep. Therefore, if he struggles then Paul Pierce can step right in just as he did on opening night. Tomyoy: If judging a better season from a base statistical standpoint, Rajon Rondo likely has a better season than Lance Stephenson does. While both are starting for their respective teams, the responsibility set for Rondo is much larger, and he’s more likely to have the ball in his hands. With the type of spacing that George Karl hopes to integrate into the Kings offense, each game will come ripe with opportunities for Rajon to stack up the assists. On the other hand, Lance only needs to anchor a fifth spot alongside four teammates that made up the majority of a fine-tuned engine that lead the league in offensive efficiency last year. Tavidian: Statistically, Rajon Rondo will have a much better season than Lance Stephenson. Rondo will undoubtedly be put in a number of situations where the ball is going to be in his hands. He plays a big role as the second best player in the team and as a point guard, Rondo has the ability to create opportunities for his teammates, as well as himself. Nevertheless, this does not mean that Stephenson is not integral in the Clippers’ fight to the top. Stephenson can have an impact far greater than Rondo. The Clippers are one of the top 5 teams in West, maybe even in the entire league and as a roll player he is in a position of significant value come playoff time. 3. Paul Pierce showed some of why he’s here in Game 1. Over/Under 4.5 games this season where we can point to Pierce as the catalyst for victory? Beas: Paul Pierce is “The Truth” for a reason and it seems like age is really just a number to the wise veteran. I would go over 4.5 games where Pierce will be the catalyst for a victory. Tomyoy: Over. If including the incredible 35-point comeback against Portland in the final game of the preseason, then it can be considered that the calling for Paul Pierce at this stage of his career is to be the savvy veteran who lives to stretch the goal post for the opposition. He did that plenty for the Wizards last season, and there is no greater example of that than the now-infamous “I called game” buzzer beater against the Hawks. One could say that’s the reason the Clippers brought him here, but Pierce himself would likely be the first person to mention that. Tavidian: Over. This is exactly why the Clippers acquired Paul Pierce in the first place. He has the type of grit and confidence to take that big shot at the very last minute – an alternate to Chris Paul and Blake Griffin. It’s an eight-two game season and he will have more than an ample amount of opportunities to be the catalyst for victory. He might be dirty, but after all he is The Truth.